The diesel motor rumbles vibrating the ship until we anchor. Even so, this expansive wildness is never silent. At night we drop anchor. No silence here either. We are at the confluence of the three chutes of the 65 mile long "Y" that is Glacier Bay. The long narrow spaces surrounding us pulse with the sound of living glacier. The sound signature of glacial motion comes with startling clarity and frequency to where we roll on the sea swells. Sound travels to us down three geologic auditory canals. Sounds are guided down every unobstructed valley and inlet to this place. They roll along the water's surface and sheer rock mountain corridors. Night falls. We listen to the conversations of mountains from this centerpoint of a world disappearing. Appropriate, perhaps, that glaciers retreating at a lightning pace -- the fastest glacial retreat in the world -- would produce the sound of thunder. "Sumdum" in Tlingit. 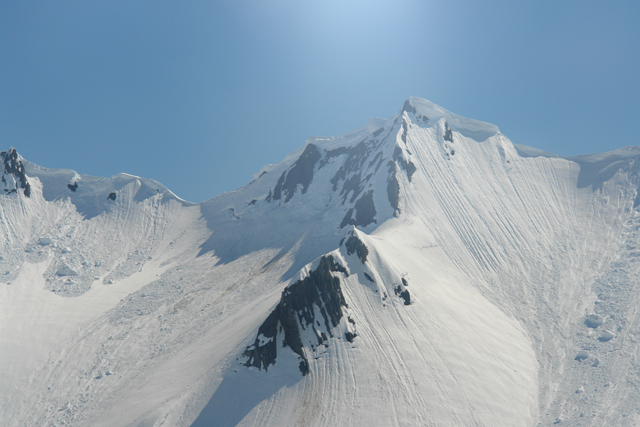 Continue reading Sound Sketch -- Multisensory Travel to a Glacier. While the most unique moment of the day was entering the tandem sea kayak via electric winch and a harness called the McKinnon Hugger this peaceful return to the Sea Wolf after exploring Reed Glacier on a sunny May day was a memorable moment. After years of trepidation about the stability of kayaks I finally got in one using this theatrical "high seas" entry method. The Sea Wolf is out fitted with a surprisingly comfortable and secure device called the McKinnon Hugger. It uses an ingenious caliper action and, when attached to the ship's davot (arm & winch) becomes a surprisingly effectives way for quads like me to kayak. Continue reading Photos from Glacier Bay. Food - The Key to Nautical Tranquility! Aboard a small ship or yacht a good crew works hard. The crew of the Sea Wolf is a great crew. Kimber Owen, owner of Sea Wolf, took me on a ship inspection to examine in detail the retrofitting done to make this World War II minesweeper into a wheelchair-accessible outdoor adventure platform. Boarding in Gustavus in my wheelchair was easy with the long ramp that captain Mike and engineer Wayne had waiting. This sort of attention to detail went far to making me comfortable with a potentially very awkward transfer. Ultimately, it established a baseline sense of the accessibility of the boat, the competence of the crew, and the safety of the upcoming cruise. So many impressions are established in the first four minutes! Naturalist Sarah is a fountain of information on the natural environment. Quick to share and eager to communicate effectively she gives the voyage depth along with Kimber through their natural history duets as we pass or approach items of interest. An ample library of books and videos adds to the resources and, reportedly, the crew has developed several activities for when kids are aboard. I will try my hand at bringing in some fish for the table to see what magic chef Heidi can work on it. Fresh dill, cilantro, ginger, as well as salsas, chutneys, and sauces that I have never experienced before show up at every meal -- except for cookie breaks! The 12-foot table stretched across the enclosed stern of Sea Wolf is becoming a warm and friendly gathering place. 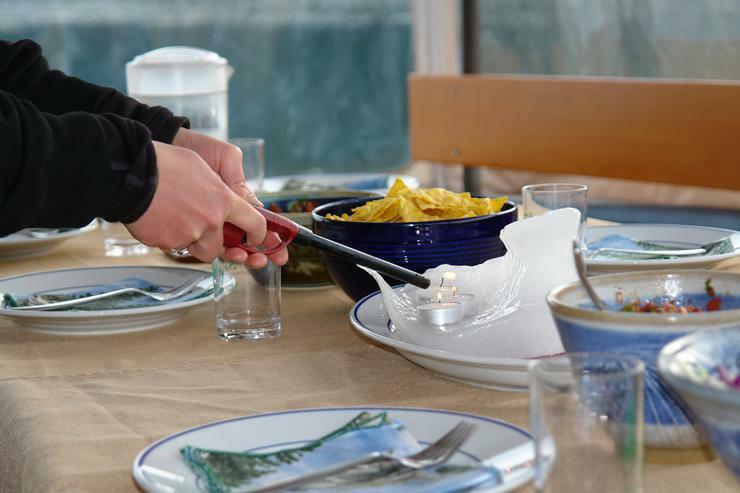 The addition of an iceberg flake ("bergie bit") as a table decoration reveals just the tip of the thought and preparation that went into planning this cruise. QUID PRO QUO reveals the eye-opening subculture of "wannabes" -- able-bodied people who want to be disabled -- in writer-director Carlos Brooks' debut feature. stormy association push him toward a more painful truth from his past? found it a struggle to create a compelling story. Continue reading Quid Pro Quo - Wannabe Culture in Film. An ageing population in China, Japan, the US and Europe is driving demand for products suited to the older consumer, including easy grip and easy open packaging as well as smaller portion sizes for consumers with smaller appetites. Socio-demographic shifts are creating demand for more convenient packaging solutions. Ageing populations in the US, Europe and Japan are placing new demands on packaging design. Easy open, easy grip and smaller portion sizes are all being developed with ageing populations in mind. More fragmented family lives, the growth in the number of women working, growth in single person households and a loss of cooking skills are all contributing to increased demand for more conveniently packaged food formats. Continue reading Documenting the Demand for a Solution to 'Wrap Rage' (Packages That Even Adults Can't Open!). 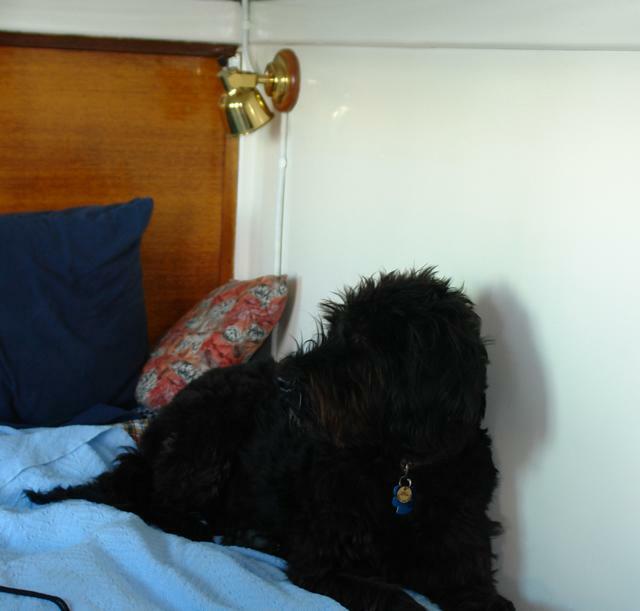 Boo is the ship's dog. She is mix Portuguese Water Dog and Australian Sheep Dog. Besides being genetically outfitted for everything from desert Outback to the rainforest she has the unmistakable habit of circumnavigating the Sea Wolf to watch over her human flock. At first I was told that she greeted me with such enthusiasm because she mistook this newcomer-in-a-wheelchair for Mike Passo of Elakah Expeditions who provided technical assistance in the skillful redesign of the boat. Eventually I realized that Boo's perpetual motion was just a canine equivalent of my incessant photo taking -- a personal obsession for for making order out of the ever-changing surroundings. Cruising so close to the geological drama and kayaking within feet of this normally inaccessible wildlife provides so much sensory input that journaling, silence, shutter-snapping, and experience-sharing over family-style meals or late into the night will not be sufficient for holding onto this encounter with beauty. Chaining these impressions into narrative already takes as much mental agility as a dog working her flock. Maybe Boo's moves will give me some insight into herding wild thoughts until they are all heading in the same direction. Columnist David Weinberger wrote this month in KM World a piece entitled When Double Standards Work. He takes on a pet peeve of mine -- fuzziness in the concept of fairness; sloppy use of the phrase "double standard". He writes on the "common sense" argument that denigrates higher-order reasoning in concrete moral dilemmas and unquestioningly assert the fallacy that all are equal in capacity and opportunity therefore any difference in treatment between two individuals is inherently prejudicial. Unfortunately, that mean-spirited social philosophy has both populist and elitist social standing in contemporary society. Let’s be completely clear about what people mean by a double standard. If two people are in similar situations and behaving similarly, to hold them to a single standard is to judge them equivalently. To condemn one and wink at the other is to use a double standard. Double standards are bad because they violate what seems to be the most basic rule of fairness: People ought to be treated the same, because we’re all equal. So, if one of the people reporting to you is having more trouble than others with, say, writing a budget, you refuse to provide any extra help because it would be unfair? If you’re big and strong, you don’t offer to help the little, infirm person as he struggles to get his luggage into the overhead bin on the airplane? And if you’re an adult, you don’t pack a lunch for your five-year-old child but expect your teenager to pack his own damn lunch? And you don’t give the homeless guy on the corner a buck because you don’t give bucks to the shoppers passing him by? OK, a common sense approach. Nah, you do help the infirm, make lunches for your little kids and occasionally give the homeless guy a buck or two. We all make reasonable decisions about how to treat people differently based upon their own abilities and needs. The stupidity of these examples makes clear the stupidity of simply saying that all people ought to be treated the same. A moment’s thought says that that’s not true. Nice "local color" ("Nah") to win populist points through rhetoric and not come off as a "topper" as he positions himself in the properly "good old boy class." For what constitutes a relevant difference? Touche! And here's the rub. Skin color is rarely relevant, but sometimes it is: Peter Cook and Dudley Moore used to do a pretty funny sketch about a one-legged man auditioning for the role of Tarzan, and it wouldn’t bother me to learn that Denzel Washington was auditioned for the role of Malcolm X but Sean Penn was not. On the other hand, is anyone claiming that it was unfair for Cate Blanchett to get a role playing Bob Dylan even though she thereby deprived some male actor? Hmm, I could argue that a TAB playing a wheelchair-user deprives an entire class of actor of almost non-existent roles. Likewise, it’d clearly be unfair to use skin color to determine who got a job as, say, a scuba instructor, but not nearly as clearly unfair to consider whether the applicants have breathing disorders. I’m pretty sure most of us would also be OK with disqualifying paraplegics, the severely retarded, sufferers from Tourette syndrome who might scare off customers, and applicants who can’t swim. Such people differ from other applicants in respects that are relevant. Entirely comfortable now that he is talking to "his people", the real "us" (vs "them") -- you know, "normal people" he settles into common sense argument and conveniently illustrates just why we need civil rights laws such as ADA, DDA, and the new United Nations Convention on the Rights of Persons with Disabilities (CRPD). Yes, especially Article 30! Ranger Randy stands impressively tall at six-feet-and-change even without his hiking boots on. This afternoon, however, he is wearing them. From here up close I judge their vintage to be about 1988 - the same year as the Toyota pickup he drives around Gustavus, Alaska. I know these facts because, contrary to what it looks like and not following logically from our conversation seconds ago about traveling through India in the 1960's, I am not doing darshan at his feet. Although, had abject obeisance brought me to my currently prone position I probably would be experiencing a greater sense of dignity than at this moment. The small towns of Alaska and the era or Paul Bunyan both nurture the "tall-tale" instinct. I will nurture that impulse aboard the Sea Wolf in coming days. At that point I will explain how I came to be folded into a quadriplegic heap here in front of the ticket counter and on the floor somewhere to the left of the wheelchair provided to me by Excursion Air. For the moment I must sign off and catch a boat from here in Somewhere- Beyond- the Border-of-Litigation-Territory, Alaska, USA. Alaksa tests the language of comparatives and scrambles metaphors: "Land of the Midnight Sun," "the No-See-Ums are so big you can see them." Even the wildlife seems a bit confused as Spring breaks out at the foot of hills (typically called "mountains" in places less topographically-endowed than Macchu Picchu, Nepal, or Tibet) that received more than 360 inches of snow in 2006 according to local yarn spinners and similarly trustworthy chaps. guided tour of the property's more canine-memorable sights and smells ending at the beach. Any late-summer Alaska-grown vegetable not suitable to comparison to the image "larger-than-a-dinner plate" is eligible for the Catch & Release Program of Alaskan Hyperbole. As I enter Glacier Bay on the Sea Wolf and pass beyond Internet, cell phone, and process-server contact I will collect notes for further posts on a state whose northern reaches cross the Artic Circle but, down here in its balmy Southeast, has me shedding the clothing I put on this morning to keep me warm in San Jose, California four hours to the south. Detroit Metro Airport and Northwest Airlines dropped disabled passengers to the floor, denied them accessible parking, damaged wheelchairs by tossing them in baggage storage and failed to provide an area for guide dogs to relieve themselves, according to a lawsuit filed Monday. The suit also says the airport and Northwest Airlines, its largest tenant, have forced people with disabilities who cannot stand or walk for long periods of time to wait in long lines and have provided improper boarding assistance. The airline also is accused of failing to stow electric wheelchairs in the cabin, resulting in wheelchairs being frequently lost or damaged in baggage storage. Some disabled passengers pay higher booking and reservation fees because they cannot access the Internet to make their travel plans, the suit contends. Continue reading Suit Against Detroit Metro Airport and Northwest Airlines. "Can you walk?" asked the TSA inspector as I came through the line in my wheelchair. "Can you lift up your foot?" "Can you take off your belt?" "Yes, but you will have to put it back on me." So, I was swabbed five different times with those mini TSA coffee filters. This turned up nothing more interesting than sandy loam, pollen, and ash from the fire storming through the Santa Cruz Mountains for the past 24 hours. After a pat-down that caused me to have serious questions about the agent's short-term memory I was freed to repack the pile of rubble resulting from the recent TSA scavenger hunt through my personal belongings. Fortunately, on the tarmac the gentleman assigned to assist me with the transfer into the aisle chair, up the loading ramp, and into my bulkhead seat was charming. Ace Castro, really seemed to be an ace at what he did - all the more impressive when he thanked me for being so specific in how best to assist me. Maybe he has developed his customer service skills by listening and questioning to be certain that he understands correctly. The typical fumbling with carry-ons and wheelchair parts was made painless by Bonnie and others on Alaska flight 333. The quality continued at the jetway in SeaTac as a competent and congenial team did the Disembarkation Schlepp with grace. I travel a lot and I travel on word-of-mouth recommendation. Excuse my obvious bias but I have a pretty good idea just by looking at somebody how reliable their their recommendation is likely to be. Skin color, age, gender, nationality don't matter. What catches my attention is when somebody else in a wheelchair tells me that a destination, transportation system, or tour operator is good. So I listened to my fellow four-wheeler Sherri Backstrom when she told me about the Sea Wolf. Captain Kimber Owen had it redesigned to be wheelchair accessible. She should know about that. She used to run a ranch that specialized in horse therapy for people with disabilities and, just to check her instincts, she works with Mike Passo of Elkah Expeditions -- another wheelchair-using outdoor outfitter. If this works out, I'll have more business for Sherri and her specialty services renting accessible yachts at Waypoint Yacht Charter Services. Of course, first she has wager against me that she will catch the biggest halibut so I either need to practice telling fish stories about "the one that got away" or deliver on my side of the bargain too! Right now I'm packing (and getting TripWolf.com wizards do do some real magic like haul Sea Wolf's home port town of Gustavus to the right latitude and longitude so I can add some favorite places once I discover them.) Then it's out the door at 4 am tomorrow to catch ann Alaska airlines flight that will get us to Juneau and our bush flight to Gustavus at the entrance to Glacier Bay. El Ayuntamiento de Santander ejecuta estos días los trabajos de mejora de accesibilidad en la calle Jesús de Monasterio, donde se van a realizar seis actuaciones, según informó el concejal de Autonomía Personal, Roberto del Pozo, quien recordó que ya se han ejecutado 15 pasos en acera y otros 13 pasos en calzada. Del Pozo recordó que, con el objetivo central de desarrollar un Santander accesible para todos y bajo la premisa de “Santander Dise?o Universal”, el Ayuntamiento de Santander, a través de la Concejalía de Autonomía Personal, está ejecutando numerosas obras de accesibilidad para facilitar la movilidad y el desplazamiento por el área urbana a las personas que tengan algún tipo de discapacidad. Se ha actuado sobre vados peatonales, que han sido adaptados a la legislación vigente en cuanto a la pendiente longitudinal y transversal y se ha sustituido el pavimento que había por losetas que permiten su reconocimiento por parte de personas ciegas. Continue reading En Ejecución los Trabajos de Mejora de la Accesibilidad en Santander (Spanish). Malta's National Commission for Persons with Disability (KNPD) is working with the country's Chamber of Architects to promote Universal Design. Continue reading Universal Design in Malta. Accessible Arts and Sydney Film Festival hosts the 2008 Accessible Cinema program. Continue reading Two Disability Film Festivals: Australia & Brazil. El próximo fin de semana Málaga acogerá la Muestra de Iniciativas y Productos Elaborados por Personas con Discapacidad, EXPOVAL 2008, que contará con la participación de 41 asociaciones y entidades sociales de la ciudad. La Muestra, bajo el lema “Hacia el dise?o universal”, apuesta por el desarrollo de productos y entornos de fácil acceso para el mayor número de personas posible, sin la necesidad de adaptarlos o redise?arlos de una forma especial. EXPOVAL se abrirá el viernes, 9 de mayo, a las 11:00 h. los visitantes podrán obtener en los 46 stands información relativa a la discapacidad, recursos y servicios especializados en relación con la accesibilidad, el empleo o la rehabilitación. Continue reading Muestra de Iniciativas y Productos Elaborados por Personas con Discapacidad, EXPOVAL 2008. Alice Camarillo is legally blind. She sued when after being repeatedly ill-treated at fast-food restaurants whenn asking for help reading menus. A federal court in Albany, NY rejected her suit but a Manhattan federal appeals court overruled the lower court. She is free to sue the restaurants under the Americans with Disabilities Act. In 2007 the senior population of Japan rose to more than 27 million in 2007. Since 2005 when the country's population peaked at 128 million population has been in decline. This "age-inversion" phenomenon is widely studied among aging and disability scholars but largely unknown to the public and not adequately addressed by policy makers. The Cabinet Office of Japan recently issued a report on the topic. The annual report by the Cabinet Office showed Japanese aged 65 or over making up 21.5 percent of the population last year, while the so-called "late-stage elderly" — those 75 or older — accounted for nearly 10 percent. "We have become a full-fledged aged society," the report declared. "The pace of aging has reached the highest level (among advanced countries) at the beginning of the 21st century, and is expected to enter a phase that no other country in the world has yet experienced," the study added. O Instituto Paradigma o Novotel Jaraguá S?o Paulo realizam nesta segunda-feira, 26 de maio, das 9h às 13h, a última turma do curso de Capacita? ?o para a Excelência no Atendimento de Pessoas com Deficiência na indústria hoteleira. O programa foi desenvolvido com exclusividade para o Novotel Jaraguá S?o Paulo Conventions, mas deverá ser estendido para os outros hotéis da Accor Hospitality. Foram capacitadas cerca de 240 pessoas, em seis turmas. Durante o curso, as pessoas sem deficiência vivenciem as barreiras enfrentadas pelas pessoas com deficiência no dia a dia. Na oportunidade, também será apresentada a Cartilha de Excelência no Atendimento de Pessoas com Deficiência na Rede Hoteleira. Continue reading Novotel Jaraguá promove curso para atendimento a pessoas com deficiência (Portuguese). Tim Goorbarry, a Port Hope-based building consultant with Viceroy Homes, says he's starting to see a demand for an unusual cottage luxury - an elevator. "In the past two or three years we are starting to see more of a request for that, if [clients] like the idea of keeping bedrooms separate and you build one floor on top of another floor." He notes that installing an elevator in a cottage (or urban home) isn't necessarily a costly venture. They cost $20,000 to $25,000, he says, noting that the expense of laying the foundation of a sprawling single-storey cottage would be the same as for a two-storey building with an elevator. The Brampton couple began researching different design options when they bought the plot of land on the Bruce Peninsula nine years ago. Accessibility eventually became the driving factor behind their cottage's design. "Even though we're young, we thought if it were a place we would retire to some day, it would be a smart move to have the main level contained," says Mr. Douma. Continue reading Universal Desgn Moves to Vacation Homes (and a Half-Step Closer to Mainstreaming in the Outdoor Leisure Industry). course in its new online continuing education program is now open. Barriers and the New Demographics. Continue reading Online Course: The Nature of Barriers and the New Demographics Starts July 7, 2008. My chapter is titled, "Social networks for senior and accessible tourism." As I research I would be interested to receive suggestions on social networks, publications, and/or marketing campaigns that you know of that are addressing these groups and their travel behavior. Contact Scott Rains with your recommendations. Continue reading Assist in Researching Tourism and Disability for Two New Books. Make $2.7 Million in Six Months Selling ADA-Compliant Hotel Rooms? Wheelchairtravel.us has a unique business concept: corner the market on ADA-compliant hotel rooms. The business plan won second place in the Miami Herald Business Plan Challenge and "expects to sell more than 67,000 nights over a six-month period, which would produce a gross income of $2.7 million." If nothing else, the "secret" is getting out about the consumer power of the rapidly-growing market that is the disability community. "While many travel websites offer information for special needs travelers and allow customers to request such rooms, none guarantees that you will get such a room, explained Robert Holtzman, the founder of Wheelchairtravel.us." Creating a specialized channel (separate but equal?) for marketing adapted hotel rooms runs counter to the international move toward Universal Design, mainstreamining, and Minimum Guidelines for Hotel Accessibility but it does have a certain marketing logic. As web designers say, "Findability precedes usability." Continue reading Make $2.7 Million in Six Months Selling ADA-Compliant Hotel Rooms?. India: Public Education by AccessAbility on "Carriage by Air of Persons with Disabilities and/or Persons with Reduced Mobility"
The office of Director General of Civil Aviation (DGCA), India has recently released the ‘Civil Aviation Requirements (CAR)– Carriage by Air of Persons with Disabilities and/or Persons with Reduced Mobility’. Therefore, it is important that the rights conferred to passengers with disabilities are clearly understood and further disseminated in a simpler format. We at AccessAbility have taken the initiative of compiling a synopsis of the CAR document, to inform and guide passengers with disabilities of the new rights. The synopsis “Air Travel – Know your Rights” is available at Trang web cá cược trực tuyếnhttp://accessability.co.in/AirTravel-Know-Your-Rights.pdf as a free download. Please feel free to circulate/ post/ distribute this further. The complete CAR Document (Section 3, Air Transport Series-M, Part-1) as released by the DGCA on 2nd May 2008 is available for viewing at http://dgca.nic.in/cars/D3M-M1.pdf. We hope you find the synopsis useful. I also request you to forward this information further. Continue reading India: Public Education by AccessAbility on "Carriage by Air of Persons with Disabilities and/or Persons with Reduced Mobility". La ciudad de León acogerá los próximos días 12 y 13 de junio la Conferencia Europea de Dise?o para Todos y Accesibilidad Electrónica, organizada por el Gobierno y la Red Europea de Dise?o para Todos y Accesibilidad Electrónica (EDeAN). La Red EDeAN está compuesta por más de 160 organizaciones de Estados miembros de la Unión Europea (UE) y su objetivo es apoyar el acceso de todos los ciudadanos a la Sociedad de la Información. Continue reading Conferencia Europea de Dise?o para Todos y Accesibilidad Electrónica (Spanish). The report below in Portuguese announces the Brazilian Supreme Court affirmation of the constitutionality of a free interstate transportation scheme directly countering industry arguments that such a scheme constituted undue government interference or even amounted to confiscation of private property. Together with the Canadian Supreme Court decision upholding an "attendant flies free/second seat free" policy these decision offer important precedents for other countries working to implement Article 30 of the UN Convention on the Rights of Persons with Disabilities. Continue reading Equality of Opportunity in Transportation Rights Upheld. This May 15, 2008 article from Travel Weekly demonstrates the kind of demand/supply bottlenecks caused by years of resistance to Universal Design on the part of port authorities and cruise lines. A travel agent who specialises in selling holidays to the disabled has called on the cruise industry to make their ships more accessible or risk losing business. Accessible Travel and Leisure agent and Travel Weekly Cruise Club member Tracy McFall said she had lost bookings worth almost ￡15,000 in the last three months as wheelchair-bound [sic] customers were uncomfortable about arrangements made to accommodate them. Continue reading Cruiselines 'must make ships more accessible for disabled travellers'. Here he reports on the wheelchair users' city tour of December 4, 2007. A strategy is underway to help make B.C. a world leader in offering travel that’s accessible to people with disabilities, and the Resort Municipality of Whistler and Tourism Whistler are offering support and the expertise of their employees to help make it happen. Whistler’s Mayor and Council voted at their regular May 5 meeting to sign onto the Accessible Tourism Memorandum of Understanding (MOU), which is part of an initiative led by 2010 Legacies Now to improve travel services in B.C. for people with disabilities. Signatories to the MOU include the provincial government, the City of Vancouver and five tourism organizations such as Tourism B.C., said John Rae, municipal manager of strategic alliances. Just in case you need another reason to cruise, listen to Ron Pettit, Access Manager for Royal Caribbean/Celebrity Cruises, discuss Royal Caribbean's offerings with Elio Navarro. I travel a lot. Sorry for stating the obvious. What travel writer doesn't travel? Yet sometimes the obvious needs restating. I travel for research and consulting a lot but my sometimes my best information comes from a global network of others with disabilities. My work depends on the generosity of others who are free to travel. And there's the rub. When their freedom is hindered, even when I am half a globe away, my freedom is also. I did not attend the Shine UnConference last week at the Bargehouse on London’s Southbank. Neither did many others with ambulatory disabilities. Maybe because they knew it was not accessible. This UnConference was designed by and for social entrepreneurs. The goal was for us to "connect, inform, and inspire" us. The problem was someone's definition of "us." Exclusion by design -- organizing an event to facilitate social transformation that does not accommodate a whole class of its own community -- is a fundamental betrayal of the event's reason for existing. Continue reading How Ashoka Let Me Down (and OXO Tower Wasn't Much Help Either). The National Association of Home Builders (NAHB) and the Senior Lending Network are joining forces with Rebuilding Together New Orleans to rebuild a home damaged by Hurricane Katrina. Volunteers from NAHB’s 50+ Housing Council will participate in a two-day community service project May 17-18 to help rebuild the home of displaced owners Hazel Tate, age 87, and Hilda Levy, age 67. On May 18, the three groups will host a media event featuring legendary actor Robert Wagner, spokesperson for the Senior Lending Network, to meet the homeowners and provide guided tours of the home and show its progress to date. The purpose of the project, which is being sponsored by the Senior Lending Network, is to make the home, which is owned by an elderly daughter and mother, both age-appropriate and environmentally friendly through the inclusion of aging-in-place and green features. While a volunteer crew works on the interior and exterior, the turn-of-the-century shotgun home will be equipped with universal design components such as a no-step entrance, wider doorways, ADA-compliant grab bars, raised countertops, comfort-height toilets, ENERGY STAR appliances and other energy-efficient features. Continue reading One Post-Katrina New Orleans Home to be Retrofitted with Universal Design, Green Features. One way to understand the Rolling Rains Report - and the network thriving behind the published word - is to think of it as the Think Tank and resource archive for implementing Article 30 of the United Nations Convention on the Rights of Persons with Disabilities. Continue reading Comparative Analysis of Disability Laws in the United States to the United Nations Convention on the Rights of Persons with Disabilities (CRPD). War creates casualties. So do ritualized battles. Civilized nations maintain humane systems appropriate for these facts of life. While it is supremely tragic to endure the parade of death and disability that is the product of war there is a redemptive quality in the compassion and instinct for social reconstruction following war or natural disasters. We have seen it after events such as Katrina, the Indian Ocean tsunami, or the Chengdu earthquake. Even as we have commented on the incompetence and bad faith efforts in response to Katrina and are now witnessing the absence of a fully human response in Myanmar we see Bruce Curtis at the World Institute on Disability (WID) recently returning from a tour of national redemption in Iraq. Australian Prime Minister Kevin Rudd has promised a $100 million Federal Budget funding boost for families with disabled adult children "to help older carers of children with a disability to plan for the transition of their children to appropriate supported accommodation in the future." At 36, former NFL player Brian DeMarco walks with a cane because of a spinal injury from sports yet he and his family have been left homeless three times due to uncovered medical expenses. Regular citizens with disabilities like Bruce Curtis step in providing global leadership in a conflict situation. National electorates reject political philosophies of unmitigated greed and the abdication of the governmental mandate to insure the common good. Heroes of the politically-anesthetizing war-substitute spectacle of professional sports are dumped on the street. Stripped of their role as warriors of the playing field they are shunted into the ranks of the untouchable ostracized -- the marginalized community of people with disabilities. The solution is to be found in the political will to enact social inclusion. This site revolves around implementation of Article 30 of the United Nations Convention on the Rights of Persons with Disabilities, "Participation in Cultural Life, Recreation, Leisure and Sport". No individual, no government, no nation -- no sports team -- is exempt. Continue reading The (Sometimes) Walking Wounded. In 2006 alone, the country recorded 2.84 million tourist arrivals due to the country’s fast growing industry, marketing success and affordable air travels. 20% of these are Koreans, followed by the Americans, Japanese and Chinese. A classic example is the Marine Life Tour in Pamilacan Island, Bohol. At the regional and policy level the groundwork for pioneers like Gilda has ben established over the years by UN-ESCAP Social Development Officer Aiko Akiyama working on frameworks such as the CRPD and the Biwako Millennium Framework (BMF) Plus Five. Toronto constitutional lawyer David Lepofsky is all fired up and he is making some changes that mean accessibility for us all. To continue the fight for accessibility, Lepofsky encouraged all participants at Saturday’s symposium to take action by hosting events such as a barrier-buster scavenger hunt, where people could look and start to identify barriers. He also suggested community forums to get more people educated and aware. Green Map ? System promotes inclusive participation in sustainable community development around the world, using mapmaking as our medium. This approach is the application of social media to the implementation of Article 30 of the UN Convention on the Rights of persons with Disabilities (CRPD). Continue reading Mapping an Alternate Future - Using Social Media to Implement Article 30 of the CRPD. 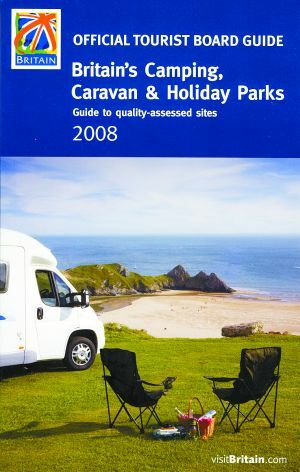 There are more than 1,000 places listed to stay, with short breaks and offers, David Bellamy Conservation Award winners are listed, there are colour maps, a guide to events and attractions, ideas for days out and you are also able to choose sites with National Accessible Scheme accommodation at a glance if that is what is required. The National Accessible Scheme has mobility impairment symbols, and also for visual and hearing problems. O Aeroporto Internacional de Jo?o Pessoa (PB), Presidente Castro Pinto, realizou 06/05 até o dia 10, o Curso de Atendimento às Pessoas com Deficiência ou Mobilidade Reduzida. Além dos profissionais da Infraero e das empresas que atuam em suas dependências, o órg?o oficial de turismo do Estado, a Polícia Rodoviária Federal (PRF), o Servi?o de Atendimento Médico de Urgência (Samu) e taxistas for?o capacitados para lidar com o público que necessita de atendimento especial. Continue reading Aeroporto de Jo?o Pessoa Ofereceu Curso de Atendimento às Pessoas com Deficiência. From September 4 to 8, 2008, the International Federation on Ageing (IFA) will be hosting the 9th Global Confhttp://www.ageingdesignmontreal.ca/UserFiles/File/Flyer_Med_EN.pdference on Ageing and an exposition entitled Ageing and Design Montréal 2008 at the Palais des Congrès in Montréal, Canada. All events are focused on bringing together key stakeholders in the fields of ageing and design in an environment that provides cross-discipline dialogue and fosters partnerships for the future. A conference flyer is available here as .pdf. Continue reading 9th Global Conference on Ageing: Ageing and Design Montréal 2008.
whether for themselves or their attendant. effectively pay double what others pay to fly. accommodated," said Pat Danforth, Chair of CCD Transportation Committee. issue and the strong decision they handed down. Desde janeiro de 2005 os novos empreendimentos hoteleiros em S?o Sebasti?o devem deixar pelo menos 5% de seus leitos de forma a atender a Lei de Acessibilidade. As áreas comuns devem ser 100% acessíveis. Esse panorama foi apresentado para proprietários de hotéis e pousadas, além de comerciantes durante a última reuni?o do Conselho Municipal de Turismo (Comtur), pela presidente da Comiss?o de Acessibilidade, Kátia Gomes Severi. Ela aproveitou a ocasi?o para tirar as dúvidas dos presentes e mostrar o que o município tem feito para adequar os prédios e espa?os públicos à legisla? ?o nacional. Continue reading Brasil: Hotéis Devem Ter 5% de Seus Quartos Acessíveis (Portuguese). El primer lugar, acreedor a 40 mil pesos de premio, una medalla y diploma, fue para el proyecto Chapulín, presentado por la empresa Rigoletti Casa de Dise?o y cuyos autores fueron Arturo Millán Martínez, Eduardo González Morón y Juan Alberto Islas. éste último explicó que su prototipo cuenta con un dise?o universal, es decir, no sólo es para personas con movilidad total sino también para quien posee alguna discapacidad, cuenta con un motor híbrido y aprovecha al máximo el espacio del vehículo. Continue reading Chapulín gana el concurso Taxi de la Ciudad de México. Secretary-General Ban Ki-moon today congratulated the Government and people of New Zealand, the recipient of this year's Franklin Delano Roosevelt International Disability Award, for their efforts to improve the lives of those living with disabilities. The Award is presented by the Franklin and Eleanor Roosevelt Institute to a UN Member State that makes noteworthy progress towards the full participation of citizens with disabilities as called for in the UN Convention on the Rights of Persons with Disabilities. In his remarks at the award ceremony, Mr. Ban noted that New Zealand is widely recognized for its leadership on disability issues, particularly as a leading proponent of the Disabilities Convention, which just entered into force on 3 May. Ambassador Don McKay of New Zealand chaired the committed tasked with drafting the Convention, and his "inspired leadership ensured an open, transparent and inclusive process that led us to a successful outcome," the Secretary-General noted. The Ambassador's leadership was a reflection of his country's deep commitment to disability issues domestically, Mr. Ban added, noting that the Government's comprehensive disability strategy led New Zealand to adopt Sign Language as its third official language in 1996. It has also promoted quality living for persons with disabilities within their communities. "As a result of these many similar measures, New Zealand has become a model for the world on disability issues," said Mr. Ban. "Your example strengthens our resolve to ensure human rights and development for all – especially through the full and meaningful participation of persons with disabilities in every level of society, from the local to the global." The Secretary-General's own country, the Republic of Korea, was the first recipient of the Award, which was established in 1995. Continue reading New Zealand Recevies the Franklin Delano Roosevelt International Disability Award. 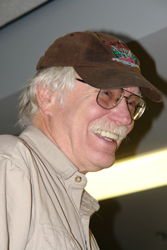 I want to reach back to showcase a pioneer of inclusion - Greg Lais of Wilderness Inquiry. 1. 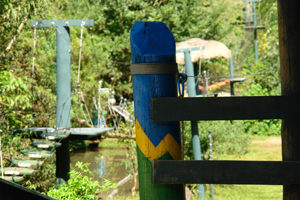 Select a popular, voluntary, cooperative venue that has inherent challenges. 2. Provide support so that everyone can participate without changing the fundamental nature of the experience. 3. Actively recruit people from diverse backgrounds and ability levels. 4. Facilitate the process to optimize opportunities for social integration to occur. 5. Provide financial assistance to keep the program within reach of people from all socio-economic backgrounds. WI has carefully refined its program to seamlessly serve people with disabilities and others who are neither disabled nor associated with other “minority” communities. It is the only program serving people with disabilities and chronic illness in the United States that regularly attracts people who would never consider personally participating in a program for “special populations.” In short, WI has developed a highly effective approach to facilitating social integration – it reaches people from all walks of life, opens their minds and changes their attitudes. Continue reading Wisdom from Wilderness Inquiry. Continue reading Ministra Suplicy Lan?a Programa Viaja Mais Jovens (Portuguese). The advent of low-cost airlines and zealous interpretation of safety regulations has led to discrimination against people with disabilities, experts say. A group of deaf people from Melbourne has launched a discrimination case against Tiger Airways after the budget carrier insisted they travel with a carer last month. But [Australian] federal disability discrimination commissioner Graeme Innes says the problem isn't limited to Tiger. "There have been endemic problems in airlines over the past few years where people with disabilities have been refused carriage because of their disability,'' Mr Innes told Sky News. Continue reading A Discrimination Case Against Tiger Airways. Continue reading REATECH: Una Abertura (Spanish). Há uns dois meses atrás, quando meu namorado me perguntou se gostaria de ir com a ele à Reatech, n?o pensei duas vezes e disse que sim. Afinal, estou escrevendo num blog sobre acessibilidade, inclus?o, reabilita? ?o bla bla etc e tal. Nada mais normal do que acompanhá-lo ao evento. às vésperas da feira, ent?o, quando percebi que meu namorado n?o parava de falar nos test drives que poderia fazer e nas cadeiras e acessórios que encontraria por lá, comecei a me perguntar se n?o me sentiria deslocada num evento como esse. Pra meu alívio, essa desconfian?a passou quase que por completo assim que cheguei na feira, pois, como em tudo que é evento de porte internacional, você tem muito o que ver, ouvir, conhecer e explorar. Mas como eu disse: quase. A primeira meia hora foi estranha. Continue reading REATECH: "E dessa vez a diferente era eu!" (Portuguese). "Accessible transit, not only in London, [Ontario] but in the province, is broken," the University of Western Ontario Master's student told a crowd of about 150 supporters outside city hall. I’ve known all along that this was important and it’s something I just have to do, but when I think of all the people who came out to see me off today, all the people with disabilities around this province stuck in the ridiculousness that is accessible transportation, and all the friendly motorists along the way who happily shared the road with me today, well I know that not only can I accomplish my goal to reach Ottawa, but we truly are on the cusp of something revolutionary. People seem to really understand the problem and empathize with our plight–they genuinely believe that we, the disabled, have the same right to access transportation just like everyone else. I think that’s really significant. Continue reading Mobile March - Canada. Em matéria de acessibilidade turística, o Brasil ainda engatinha se comparado aos Estados Unidos, Canadá ou Inglaterra. Além das poucas op? ?es de destinos e habita? ?es realmente acessíveis, as existentes costumam ser caras. Mas o município de Socorro (SP), a 130 quil?metros de S?o Paulo, promete mudar este cenário. Um convênio entre o Ministério do Turismo, a Prefeitura, a AVAPE e o programa Aventura Segura criou o projeto Socorro Acessível, para tornar a cidade - um dos pólos de turismo de aventura mais importantes do interior paulista - o primeiro destino turístico do país totalmente adaptado às pessoas com deficiência. Continue reading Da AVAPE: Turismo acessível. La région Riviera Cote d'Azur, dont la ville de Nice est l'un des centres majeurs, peut se vanter d'être l'un des principaux sites touristiques fran?ais. Une réalité qui a sa part d'ombre ! Continue reading La région Riviera Cote d'Azur (French). REATECH is South America's largest disability expo. Promoters of Inclusive Tourism gathered from throughout North, Central, and South America to add an entirely new topic to the typical showcase on technology, sport, self-help, and disability culture. People come to disability through a variety of means. Landmines is one preventable cause. below the International Campaign to Ban Landmines (ICBL) hails the passage of the UN Convention on the Rights of Persons with Disabilities. Continue reading CRPD and the International Campaign to Ban Landmines (ICBL). Twenty-eight-year-old Sita KC took to the skies today becoming the first disabled person in Nepal to be airborne without the help of an engine. KC, who is suffering from spinal paralysis and cannot use her limbs waist downwards, went paragliding with Swiss national Sebastian Baqeun in tandem for a 50-minute flight under the aegis of Sunrise Paragliding. She went into launch mode from Sarangkot cliff of Pokhara. Continue reading Inclusion in Adventure Sports Makes Inroads in Nepal. O Parque dos Sonhos, onde está localizado o hotel, também será referência para a certifica? ?o de turismo de aventura, pois é o primeiro a adotar integralmente as normas da ABNT (Associa? ?o Brasileira de Normas Técnicas), que foram regulamentadas a partir do Projeto “Aventura Segura”, coordenado pela ABETA (Associa? ?o Brasileira das Empresas de Turismo de Aventura) em conjunto com o Ministério do Turismo. Sérgio Franco, diretor da Adventure Sports Fair, acompanhou a visita, e pode constatar com orgulho o fato de que grande parte das iniciativas hoje implementadas tiveram início nas edi? ?es da feira, que se tornou o ponto de encontro anual entre os empresários do turismo, ONGs e Governo. Todas essas iniciativas tiveram início durante a Adventure Sports Fair – o grande ponto de encontro entre os empresários do Turismo, Ongs e Governo. Continue reading Sérgio Franco, Marta Suplicy, Hotel Fazenda Campo dos Sonhos em Socorro Continuam Trabalho do Pioneiro De Turismo Inclusivo Dada Moreira. As Universal Design continues to establish itself as baseline "good design" innovators like Smart Design continue to innovate and open new markets. Continue reading Femme Den: More Linkage Between Universal Design and Women as a Market. Last week, the Chinese government adopted a law amendment to better protect the country's more than 83 million persons with a disability, in the run-up to the Beijing 2008 Paralympic Games in September..."
Continue reading Disability Rights in China. Green Map System has promoted inclusive participation in sustainable community development around the world since 1995, using mapmaking as our medium. Over 450 locally-led map projects in 50 countries have successfully published 335 Green Maps, used by millions to connect with green living, nature, social and cultural resources near home and while traveling. While all use Green Map Icons to highlight both positive and challenging sites, each powerful guide is unique. Now, we're taking our inclusiveness mission the next step by developing an open interactive Green Mapmaking tool that will help people worldwide quickly share their own selection of sustainability sites, pathways and resources online. Continue reading My Green Map. Include 2009 at the Royal College of Art, London 5-8 April 2009. Transforming Practice in Design, Research and Business. Continue reading Event Announcement -- Include 2009.